New York à la Keiko: White Pike Whiskey Wedding! This is our whiskey brand of choice for our wedding day! We're hauling a case of White Pike Whiskey and McLure's pickle brine to our wedding reception for some pickleback shot action! 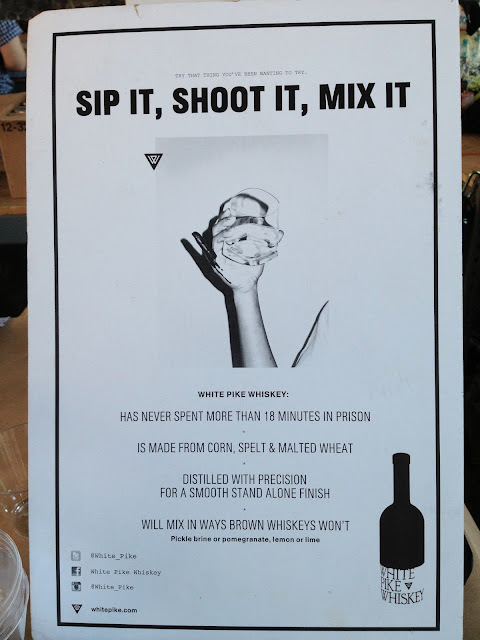 I actually tried White Pike whiskey AND pickleback shots for the very first time on the same day at this Of A kind event in Chelsea. It is when you take a shot of whiskey followed by a shot of pickle brine! It's great! It originated from Williamsburg, Brooklyn and not sure if it is served outside Manhattan yet but most bars have pickle brine so if you ask nicely, you can get! This whiskey is produced in upstate New York and we're all for supporting our local businesses. Our guests can have Jameson whiskey any time, any where but not White Pike. This whiskey has a slightly sweet and wheat taste which I thought was unique. After drowning it down with pickle brine though, it doesn't really matter that much. Hopefully we'll be able to finish all 12 bottles but if not, these are good for mixing with citrusy juices such as grapefruit or lime! Hints of fresh buttered toast, rich in the middle and smooth as soft leather. Easy drinking and adaptable – shoot it, sip it, or mix it. Pickle brine or pomegranate. Lemon or lime.